Thankyou for helping save us from extinction. Rwanda, also known as the ‘Land of a Thousand Hills’, with its stunning landscape scenery and friendly people, is home to a third of the endangered mountain gorillas. These rare and gentle primates, who share 95% of our genes, live in the Parc National des Volcans. Lying in the Virunga Conservation area where Dianne Fossey dedicated her life studying the behaviour of mountain gorillas. Unlike humans whose total population is estimated to be in the billions, there are only 720 mountain gorillas remaining in the Montane forests of Rwanda, Uganda and Congo. 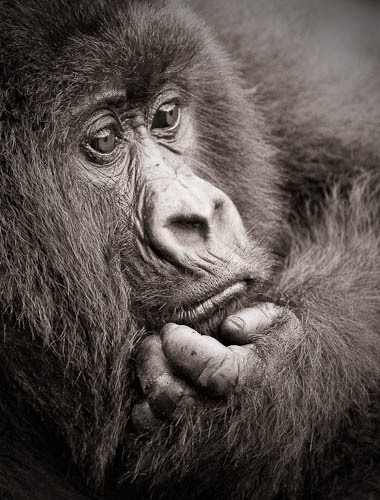 Therefore gorilla conservation is mandatory to their survival, and Rwanda is at the forefront of gorilla conservation. Parc National des Volcans is one of the 3 National Parks where tracking of the endangered mountain gorillas can be carried out. 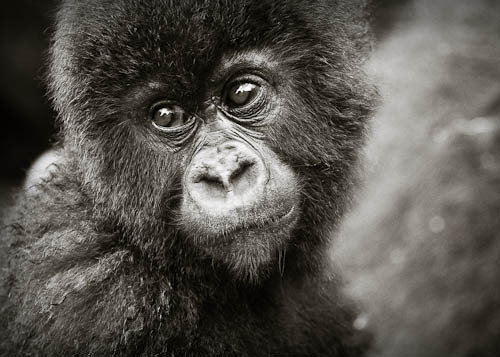 There are currently five gorilla families open for tracking to tourists in Rwanda. These are; Amahoro, Susa, Group 13, Sabyinyo and Umubano. Other groups are for study purposes. The ‘International Gorilla Conservation Programme (I.G.C.P) is a unique partnership, formed in 1991, comprising of three coalition partners, the W.W.F (World Wildlife Fund), A.W.F. (African Wildlife Fund), and the F.F.I (Fauna and Flora International – Vice President is Sir David Attenborough). It’s objective is to achieve maximum impact to save the mountain gorillas from extinction through working in close partnership with all three countries, using sophisticated monitoring techniques, socio-economic development and conservation, and working closely with key decision makers. NB; As a child, I always dreamed of seeing the mountain gorillas, and was concerned that by the time I was old enough, I might be too late. Now that I have recently succeeded in fulfilling one of my life long dreams, I hope that my children and their children have the opportunity to have the same humbling experience as what I had. It is up to us to preserve these amazing gorillas for the generations to come, not only of the human race, but also of the mountain gorillas. Thanks so much David, it was an amazing experience to spend an hour with these Gorillas, something I will never forget!